There isn’t a lot that sounds better on a hot day than fresh, icy low calorie smoothies but trying to buy one at a restaurant or fast food place is a recipe for trouble. Smoothies made at fast food establishments tend to be ice cream based – yikes! A recent survey decided that the worst drink in America was an ice cream milk shake from Cold Stone Creamery with 2000 calories, 130 grams of fat, 68 grams of saturated fat, and 153 grams of sugar. The number two worst drink was a smoothie. This smoothie came in at more than 1400 calories with 44 grams of fat and 214 grams of sugar. Unfortunately, this is not that unusual. Low calorie smoothies are rare, with most smoothies being sold today by big chains and small stores alike crammed full of sugar and cream in order to appeal to the masses. Weight loss smoothies may be the foundation of detox diets out there, but they sure aren’t made like these! The base of a smoothie low in calories should be low-fat or non-fat yogurt. This will help give the low calorie smoothie a more consistent and smooth consistency like ice cream but without all of the fat and sugar. Add ice and sometimes skim milk to give the smoothie a more drinkable texture. Juices can also be added instead of milk or yogurt, but it’s recommended that you skip the pasteurized variety and stick to the freshly squeezed kind. Investing in a juicer if you intend to make a lot of smoothies and diet drinks is not a bad idea. Banana is a great fruit to put into low calorie smoothies to add even more creaminess and help minimize lumpiness or unpleasant texture. It’s easy to throw in the wrong fruits and end up with a puree instead of a drinkable smoothie. Adding banana to the mix almost guarantees a smooth and creamy concoction. There are thousands if not millions of interesting and delicious weight loss shake recipes out there so it’s just a matter of selecting what you like best and before long you’ll probably find yourself experimenting and creating your own recipes. It’s easy once you’ve decided on a “base” formula that you really like. 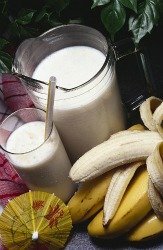 Low fat yogurt, ice, and banana is one example of a “base” recipe to which you can then add all kinds of fruits – or vegetables. Making smoothies using vegetables is a twist on the popular healthy diet drink. “Carrots, tomatoes, and celery” is a common combination in vegetable smoothies. You can also add peppers and Tabasco sauce to the basic recipe for a spicy, salty treat. Another idea is to add carrots to an otherwise sweet smoothie. Blueberry and other berry smoothies are great flavors to try this with. Cold, smooth, and ever so yummy. Those are just three of the reasons that low calorie smoothies are a diet craze that is sure to never go away so invest in a juicer and a good blender and start experimenting! As long as the ingredients you’re starting with are fresh and clean, you’re bound to come up with something that’s as healthy as it is delicious.